SOID is important new comprehensive tenants’ rights legislation, enacting one of the Mayor’s Housing Affordability and Livability Agenda (HALA) recommendations. The final bill created a new protected class for people with alternative sources of income, created a new “first in time” requirement to make the housing application process more objective, require that rent assistance be accepted to cure eviction actions, and banned “preferred employer” programs, the sweetheart deals for renters employed by certain employers. The Council will monitor this legislation and evaluate its impacts. The Seattle Office for Civil Rights (SOCR) is responsible for enforcing this legislation. SOCR worked with stakeholders including Rental Housing Association of Washington, Washington Multi-Family Housing Association, Urban League, Solid Ground, Tenants Union of Washington and facilitated two community public meetings to draft the Administrative Rules. Resolution 31669 provides landlords with information about their obligations under the Fair Housing Act to consider as tenants, people with arrests or criminal records, who have been cleared of a crime or served their time. The resolution clarifies HUD’s guidance to property owners helps people seeking housing, and protects landlords from fair housing complaints and lawsuits. Categorical bans on all people with criminal records actually increase recidivism and make communities less safe. This is an important first step in establishing clear screening rules for Seattle landlords. It’s important that all housing providers understand HUD’s advice. The Mandatory Housing Affordability/Residential (MHA/R) Program requires all residential developers to contribute affordable housing by including it in their development or paying into an affordable housing fund. The requirements will apply only after Council adopts future zoning changes, scheduled for Council consideration in 2017 and 2018. In the legislation, there is a requirement that a displacement risk analysis approximate the number of existing affordable housing units demolished as a result of future upzones. This lays the groundwork to ensure that the mandatory affordability requirement for developers will be adjusted higher over the entire area being up-zoned commensurate with the number of units likely to be demolished. For the last 30 years, housing advocates have been trying to get the need for housing displacement mitigation recognized. Councilmembers O’Brien and Licata were the first to encourage the city in 2014 to study how development left unregulated without some level of mitigation can impact vulnerable communities. Since 1986 affordable housing levies in Seattle have helped many households access and maintain their affordable housing. The voters supported the recommendationsof theHousing Affordability and Livability Agenda (HALA) Committee, the Mayor, and the Council in voting to pass the renewal of the housing levy, in the amount of $290 million over the next 7 years. The levy directs spending for: Rental Production and Preservation of 2,150 affordable apartments; Operating and maintenance of 350 affordable apartments; Homelessness prevention for 4,500 families; and Homeownership funds to assist 380 low-income homeowners. Affordability is a major issue for many District 1 residents as well as residents throughout the City. The average price for a 1 bedroom ranges between $1500 and $1700 per month making it difficult for a household earning less $53,000 per year to find an affordable dwelling unit. I believe a truly comprehensive affordable housing strategy must include new programs to preserve existing affordable housing. Increasing housing options for LGBTQ seniors. Across every Census division in the U.S. Seattle has the least developed services for LGBTQ older adults and their families. Unlike most large cities, we are also running behind on developing housing for LGBTQ seniors. In November the City Council adopted the 2017 City of Seattle budget and 2017-2022 Capital Improvement Plan, and “endorsed” a 2018 budget that will serve as the base for next year’s budget process. Below are a few of the items I worked on. West Seattle Bridge studies – This will continue work begun by former Councilmember Tom Rasmussen, adding $100,000 to carry out the evaluations called for in the West Seattle Bridge/Duwamish Corridor Whitepaper to improve safety, incident management, and traffic flow on the West Seattle Bridge. South Park Family Service Center – This funding will support health and human services, a leadership program, and an education program in South Park. T-5 Quiet Zone – A statement of Legislative Intent for SDOT supporting work with the Port of Seattle, the Federal Railway Administration, and the railway companies doing business at Terminal 5, to extend the quiet zone from Terminal 5 to the Delridge Way/W Marginal Way intersection. A task force on South Park Public Safety – Supporting recommendations regarding the public safety and vitality of that neighborhood; I co-sponsored this with Councilmember González, who chairs the committee for public safety issues. The Budget Committee approved my proposal to create a $29 million housing bond intended to expand financing for affordable housing in Seattle for 2017. With a vote in favor of this proposal, the Council signaled our desire to prioritize housing in the budget process, and without pitting Seattle’s housing needs against other citywide priorities. We are in a homelessness state of emergency. We need to build today to meet the need. Building today is less expensive than building at future costs, and these funds will continue to benefit the community for the entire period of the bond payment under their 50+ year requirement to be maintained as affordable. I also sponsored the creation of a Child Care Mitigation Fund, to address the displacement of before-and-after school child care from Seattle School District buildings. The funding would be available for use by the District and child care providers to make arrangements to keep child care on-site at schools or assist in relocating where providers would otherwise be displaced. Another item I sponsored is an Economic Development Issue – Seattle Legacy Business study funding, for a study to determine the scope and definition of a Seattle Legacy Business program to preserve businesses that contribute to the City’s unique culture and character and are at risk of being lost. Additional budget information is in the Police and Pronto sections. A summary of my other budget actions is linked here; here’s a link to the summary of all the changes the Council made; the lead sponsor is listed at the end, though many of the proposals had additional co-sponsors. There are many others for which I was listed as a supporting sponsor. Seattle is known for its unique neighborhoods, each home to a thriving landscape of locally-owned businesses that occupy an essential role in the stories and rituals that define the city. In my first week as a Councilmember, a District 1 resident brought me the idea of a Seattle Legacy Business Program, modeled after a successful San Francisco effort. Since I chair the committee with oversight of economic development issues, I was inspired by the effort. I worked with the Washington Trust for Historic Preservation, Historic Seattle, and 4 Culture to survey community members to identify our most important business establishments; identify elements that contribute to the culture, character, and history of Seattle; and establish tools to protect them. The Mayor’s Commercial Affordability Committeerecommendations supported the conclusion that more work was necessary to determine how a Seattle legacy business might function. During the 2017-18 City budget process, I secured funding to determine the scope and definition of a new Seattle Legacy Business Project. In March we found out over 150 trees had been illegally removed from Parks and SDOT property in the East Admiral neighborhood, west of SW Admiral Way up the hill from the West Seattle Bridge, on a steep slope in a potential landslide zone. This is a public safety threat: SW Admiral Way is a major arterial with 25,000 trips per day. The City Attorney’s Office and the Seattle Police Department began an investigation. I noted that the sanctions must be significant enough to deter this kind of activity in the future. Penalties need to be strong enough so that those with financial means don’t see illegal tree cutting as a cost-effective way to increase their views and property values. Trees play a significant role in maintaining soil stability in an environmentally critical area by absorbing water, thus lessening the risk of landslides onto a major arterial. Further, trees maintain air quality by absorbing carbon —an important issue in West Seattle and South Park, which sit adjacent to SODO and the Duwamish industrial area. In September the City Attorney filed two civil lawsuits for $1.6 million in total damages and fines over the unauthorized cutting of 150 trees on public land in West Seattle. I thanked the City Attorney’s Office for filing two civil lawsuits, and their considerations of the use of a full range of the legal remedies available for civil suits, including timber trespass, which allows for triple damages. The legal case is ongoing, as is the Seattle Police Department’s criminal investigation. The New Customer Information System (NCIS) is a joint Seattle City Light (SCL) and Seattle Public Utilities (SPU) project which replaced the existing SCL and SPU billing system. The old system supported billing and customer processes for both utilities, but failed to meet current business practices. In March we learned that the NCIS project was over-budget and off-schedule. The Council learned that the project budget had increased to $108 million and, whereas the original delivery date was October 2015, the project wasn’t estimated to go-live until the fall of 2016. Over Labor Day weekend SPU and SCL worked overtime to roll out the new billing system. You may have seen some of the reports regarding privacy issues that were revealed as part of that roll out. However, those were quickly handled by SPU and SCL who took the system offline to ensure customer privacy was maintained. The early wrinkles seem to have been ironed out and the system is working as intended now. On June 1st Seattle proclaimed June LGBTQ Pride Month. The Council and Mayor recognized that the fight for equality is not over and we must continue to lead the nation in establishing policies to prevent discrimination. Some question whether patterns of gentrification are related to this increase in hate crimes, given the decline in the LGBT population in Capitol Hill, and the reduction in the number of African-Americans in the Central District. I have worked with the City Auditor to investigate the reporting of hate and bias crimes in Seattle, to determine whether we analyze bias crimes reporting data for trends that eventually influence resource allocation, and whether crimes are investigated and prosecuted as bias crimes. The City Auditor will be carrying out this work in 2017. Given the current national political environment, where we have seen a surge of hate crimes in the wake of the 2016 elections, this work is even more important. I worked to assist residents on Beach Drive SW to address the high incidence of drag racing (see video) and driving that is dangerous to public safety. The racing had been happening in the portion of Beach Drive SW that extends south from the lighthouse. The neighbors had requested the installation of speed bumps in 2015. Earlier this year community members began the process of applying for funds through the Neighborhood Parks and Street Fund. I requested that SDOT consider traffic calming measures to address the drag racing. SDOT agreed to install three speed bumps, and they were installed in September. During 2016, the Council voted to add 114 new police officer positions. As representative of District 1 since the start of 2016, I have heard consistent, strong support for hiring additional police officers from both businesses and residents. I support hiring additional officers: we need additional officers to address 911 response times, to enhance patrol operations, and for proactive policing, all of which are important to a comprehensive public safety approach. During the City’s 2017-2018 budget, I voted to approve the addition of 72 new officer positions. Earlier this year, in August, I voted to add 42 officers, and fund them through additional use of the City’s General Fund. The first 100 new officer positions were funded without any new tax resources. In addition, I co-sponsored the re-establishment of a Community Service Officer program with SPD. Community Service officers (CSOs) are unsworn officers who are able to prioritize community services associated with law enforcement, such as crime prevention; CSOs can also help free up SPD officers for 911 response. The 2017-8 budget also increases the number of staff to take 911 calls, which have increased by 13% since 2010, and over 40% for Priority 1 life/safety 911 calls. This will help prevent wait times for people who call 911. Early in 2017 the City Council will be considering comprehensive police accountability legislation as part of the 2012 Consent Decree with the US Department of Justice to reform policing in Seattle. A federal judge is overseeing this reform process. In 2015, before I took office, a previous Council set aside $5 million to expand the Pronto bike sharing system, but required that SDOT provide an implementation plan and financial analysis and bring both back to the Council. Early in 2016 the Council received a proposal to: purchase the Pronto bike-share program for $1.4 million, pay off Pronto’s $1.275 million loan from KeyBank, and plan to expand bike sharing in 2017, which could result in an expansion of Pronto, or an entirely different bike share system. I didn’t support this purchase, and voted “no.” I favored allowing for a private-sector funded system along the lines of the Car2Go car-sharing business. Car2Go provides a service many use (myself included), at no public cost. The legislation passed 7-2. I proposed amendments to redirect the $5 million toward fulfilling the existing Bicycle and Pedestrian Master Plans, and allow for a private bike share system, without public costs, as in New York. The amendment failed. The City purchased Pronto, but ridership is low. The Mayor’s proposed 2017-2018 budget included funding to continue operating the Pronto system. I proposed a passing amendment to remove that funding. The City received no bids to expand the Pronto system, not even from the company that operated it. The bids for a new system are for electric-assist bikes. A proposal from SDOT is expected in early 2017. While a new system may not include an operating subsidy, I remain concerned about the cost of replacing equipment with a rapidly evolving technology. Shortly after taking office this year, community advocates expressed interest in making changes to the Fauntleroy Boulevard Project, to support it as a visual gateway to West Seattle. In response, I organized meetings between community advocates and SDOT and City Light. At our request, City Light and SDOT provided cost estimates for undergrounding utility wires, which showed a funding gap of $4-5 million; a subsequent meeting revealed additional potential costs for a total gap of at least $5-7 million. Upon my request to Mayor Murray, during the budget process City Light revised the project to specifically include $1.5 million for the street light improvements and utility pole relocations that were recommended by community members. Improvements to Fauntleroy have long been a priority for the community, and were first prioritized in the 1999 West Seattle Junction Hub Neighborhood Plan, and later in the West Seattle Triangle planning process. SDOT is now working on final design, with construction targeted for late 2017. You can sign up for the project email list for updates here, and contact the SDOT project team at fauntleroyblvd@seattle.gov. Earlier this year the Council considered a “street vacation” to remove a city street for a potential arena in the SODO neighborhood. Under city policy, street vacations are judged by whether they 1) protect the functions of the street right-of way; 2) have any adverse land use impacts, and 3) whether there will be public benefits sufficient to offset the loss of the street. I heard some support from constituents in District 1, but heard widespread concern from a significantly greater number of West Seattle and South Park residents about access to Downtown. Many in West Seattle feel they already shoulder the greatest share of our City’s burden for professional sports facilities. District 1 is separated from Downtown by SODO, and the stadiums; as the West Seattle Transportation Coalition noted, there’s been a 45% reduction in north/south vehicle lanes over the last 7 years through SODO. In the end, it seemed the one possible public benefit to meet the requirements of city policy for street vacations was an NBA team. I offered an amendment to require the ArenaCo group obtain ownership rights to an NBA team before the street vacation was granted; it didn’t pass. My “no” vote was also decided in favor of protecting industrial and maritime jobs that we have now so that we can maintain the diversified economy that has kept our region strong in good economic times as well as the downturns. Further, the legitimate traffic concerns of commuters and small business owners in West Seattle and South Park played prominently in my decision. A recent Puget Sound Business Journal article revealed that the operator of Terminal 46 signed a 2012 lease extension only on the condition that they could walk away if business was disrupted by a SODO arena—so the potential loss of jobs appears real. Since the vote, Mayor Murray has indicated he will issue a request for proposals to re-develop KeyArena at Seattle Center. SODO arena proponents have announced they will re-submit an application for a street vacation. There are many workers who aren’t on a set schedule – they work in retail, restaurants, and service industry jobs. They often don’t get their schedule until a day or two before they start work for that week – other times they’re on-call and cannot predict when they will be required by their employer to pick up a shift. In a city where affordability is such a challenge that many people need to work two jobs, others juggle childcare responsibilities, or are attending school in order to get a better job, not having advance notice of a schedule can mean forgoing other income earning opportunities. This isn’t just a workers’ rights issue, it’s a gender and racial equity issue. Check out the op-ed that Councilmembers Gonzalez, Juarez, and I wrote in February. In March we began a process with the Mayor’s Office of convening stakeholders, they regularly met to discuss individual aspects of the legislation and reported out to my Committee after each of their meetings. In total we had 10 committee meetings and discussed: employer coverage, advance notice of schedules, predictability pay, right to request, right to rest, and access to hours. 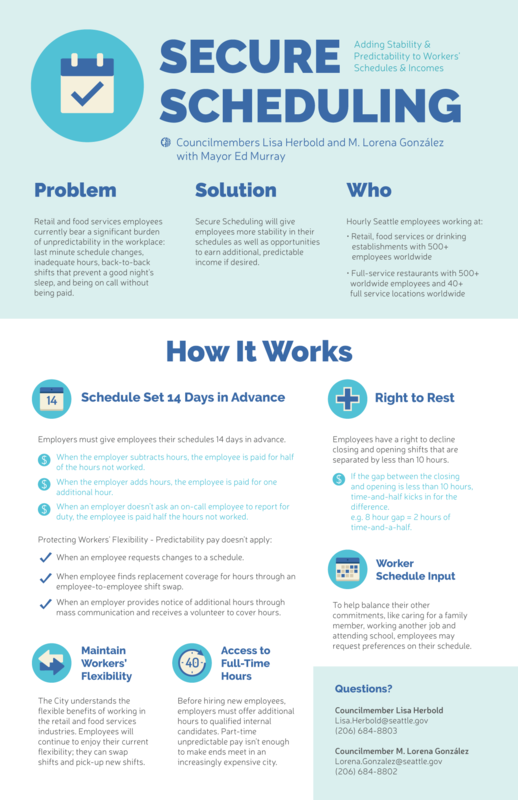 On September 19 the Secure Scheduling bill unanimously passed the Full Council and will go into effect on July 1, 2017. You can read more about the ordinance here, here and in the graphic below. that are good for the environment and our communities. that have a racial equity lens in their outreach and ways to retain participants. and that have systems in place to help young adults move into career pathways. The Resolution also requests a green job inventory of internships, apprenticeships, and entry-level jobs offered by the City of Seattle and an outreach and engagement strategy to advance green jobs as a part of the ongoing work to advance careers in the private sector. In Seattle, youth unemployment still tops 13 percent, which disproportionately impacts young people of color and those from low-income communities. Following on the heels of passing the resolution, we secured funding during budget to identify how City internships, apprenticeships, youth employment, workplace investment, and job training can lead to career paths. Whether because of a layoff at work or an unexpected medical expense, Seattle City Light (SCL) and Seattle Public Utility (SPU) customers sometimes come up short when it’s time to pay their bill and face a shut-off of their utilities. When a customer receives a shut-off notice, SPU charges a minimum of 75% of the balance due to prevent the shut-off, and SCL – up until a couple months ago – charged 50%. In June I learned that SPU and SCL were intending to make their delinquency policies consistent. I had no concerns with consistency, but I was concerned that the policy proposed was not for both utilities to require a 50% down payment, thus lowering the barrier for people with SPU shutoff notices, but that the utilities proposed instead to require that both SCL and SPU customers pay at least 75% of the outstanding balance in order to avoid shutoff. To demonstrate how the 75% down-payment standard acts as a barrier to preventing SPU shutoffs, the West Seattle Helpline provided, and I shared with the utilities, data demonstrating the number of people that they were able to assist avoiding utility shutoffs in 2015. In response, the utilities agreed to examine the delinquency policies and have since agreed to utilize the 50% down-payment to prevent shut-off. This will be implemented through a Director’s rule, and will be in place by January 1. Furthermore, a few constituents brought to my attention that Medicare or Medicaid premiums were being counted towards income for consideration for the Utility Discount Program (UDP). Since this income cannot be spent on anything other than medical costs I sought to remove it as a source income for the UDP. Again, I worked with the CEO and General Managers of SPU and SCL and they’ve agreed to remove this provision in the source of income. This will allow customers who otherwise would not have qualified for the UDP due to their Medicare or Medicaid premiums to now apply and qualify for the program. Tucked behind the Chelan Café, Terminal 5 (T5) has sat empty since late 2014 when the Port Commission authorized $4.7 million for modernization of the terminal. A draft environmental impact study (DEIS) which came out last May presented three options with varying costs and improvements that could be made to the terminal. While attending a Delridge District Council meeting I presented the Port representative in attendance a letteroutlining the concerns that I heard from constituents about the T5 project. Foremost among them is the need to provide shore power. Shore power provides electrical power to a ship when docked so that it does not have to run its diesel engines while at port; this is significantly more environmentally friendly as well as reduces noise. In addition, the letter underscored the need to implement a quiet zone for trains and utilize broadband back-up alarms to help with noise reduction. The Port chose to proceed with alternative two which represents necessary physical improvements and increased cargo throughput to make efficient and effective use of T5. While these improvements include a commitment to shore power, broadband back-up alarms, and a quiet zone, it will take continued efforts to ensure they are implemented adequately. To that end I submitted a Statement of Legislative Intent (SLI) during the budget process which requires SDOT to report quarterly on the progress of implementing a quiet zone from T5 to the Delridge Way/ W Marginal Way intersection. Seattle implemented the plastic bag ban in 2012, and since then an additional 13 cities in Washington have passed similar ordinances. We have been joined by other large cities such as Austin, Chicago, New York City, Minneapolis, Honolulu, and Boston. From 2010 to 2014, the amount of plastic bags in residential garbage declined from 262 tons to 136 tons, a nearly 50% decrease. However, there is still non-compliance, specifically at smaller grocery stores and convenience stores. The ordinance allows for a $250 fine, though SPU has not utilized it. The five cents per paper bag charge had a 2016 sunset clause. I introduced an ordinance to remove that clause; we have heard from many grocers and other businesses that they support the five cent charge because it allows them to recoup the cost of the more expensive paper bags. Additionally, at the recommendation of SPU, the ordinance restricts the use of green tinting in plastic bags to biodegradable bags only. The green tinting on non-biodegradable plastic bags has led to confusion about which bags are compostable and which are not, leading to an increased contamination rate. In May, I organized a tour of the Myers Way properties with community stakeholders and City Staff. Community members had sought assurances the decision about selling this property will occur only after the entire community, specifically low income renters, people of color and non-English speaking residents are meaningfully engaged and that FAS apply the Racial and Social Justice Toolkitand follow the Equity and Environment Action Agenda before deciding what to do with this land. I was pleased to learn that the Executive did not move forward with the plan to sell the Myers Way parcels. This issue is important to many residents residing in Top Hat, Highland Park, South Park, Arbor Heights, as well as citywide environmental groups such as Seattle Green Spaces Coalitionand TreePAC. This is a significant and important victory for the community who has worked so hard to bring the value of these properties to the attention of City decision-makers. While the property currently remains with FAS, the executive intends to “land-bank” the site. Regarding a different issue though still located at the Myers Way property, some constituents contacted me concerned about the people living in an unauthorized encampment on Myers Way. I also visited Arrowhead Gardens near the property and learned that they would like the City to provide garbage services to the site. SPU is now providing weekly garbage pick-ups for the site. In the beginning of December the Mayor announced that Camp Second Chance – the encampment located at Myers Way – would be converted to a sanctioned encampment and would allow for up to 50 tents with 60-70 people. The Mayor’s Office has promised to work closely with the surrounding communities to make the Myers Way site a safe location for encampment occupants and a good neighbor to the surrounding communities. With the implementation of districts this year it was important to me to be present and easily accessible for my constituents. I started my in-district office hours in March and since then have held 9 meetings, totaling 57 hours spent in office hours with constituents. During this time I spoke with 143 constituents about a variety of issues, ranging from HALA and small businesses, to the need for additional park space and better transit. I have held my office hours at three locations around the district including the Junction, the Southwest Neighborhood Center, and the South Park Community Center. This has helped with meeting constituents with limited mobility or those who simply do not have enough time to drive all the way down to City Hall. I will continue District 1 Office Hours in 2017; please keep an eye out for my emails and on the blogto know when I will be in your neighborhood. Posted: December 30th, 2016 under Councilmember Herbold.